Cedar City, UT, March 29, 2019 --(PR.com)-- For the first time in 42 years, Southern Utah University will not be increasing its tuition or student fees. 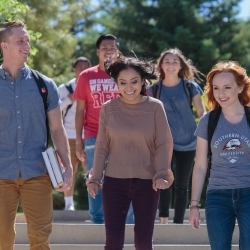 On Friday, March 29, the Utah Board of Regents approved Southern Utah University’s tuition proposal, making SUU the only school in the Utah System for Higher Education that isn’t raising tuition and/or student fees. It’s been more than two decades since any college or university in Utah hasn’t raised tuition and/or fees. According to USHE, each year following the Legislative session, the Board of Regents determines whether additional tuition revenue is required to meet the operating budget needs and help fulfill the institutional mission and role for the each of the USHE institutions. In November 2018, the Board altered its tuition-setting process and removed the old two-tiered tuition structure, which gave SUU the opportunity to present a no-increase tuition and fee proposal. After an extensive and thorough review of the budget along with open budget forums with faculty and staff, SUU administration found areas where they can shift resources and be more financially efficient. SUU’s Student Body President, D’Mia Lamar, is very impressed with the university’s commitment to put student needs first and commends the administration for their efforts to make college affordable. The tuition rate proposals for the USHE institutions range from 0 – 5 percent with an overall system average tuition rate increase of 2.46 percent. SUU is the only school in USHE to propose a zero percent increase while Dixie State has the highest increase at 5 percent.